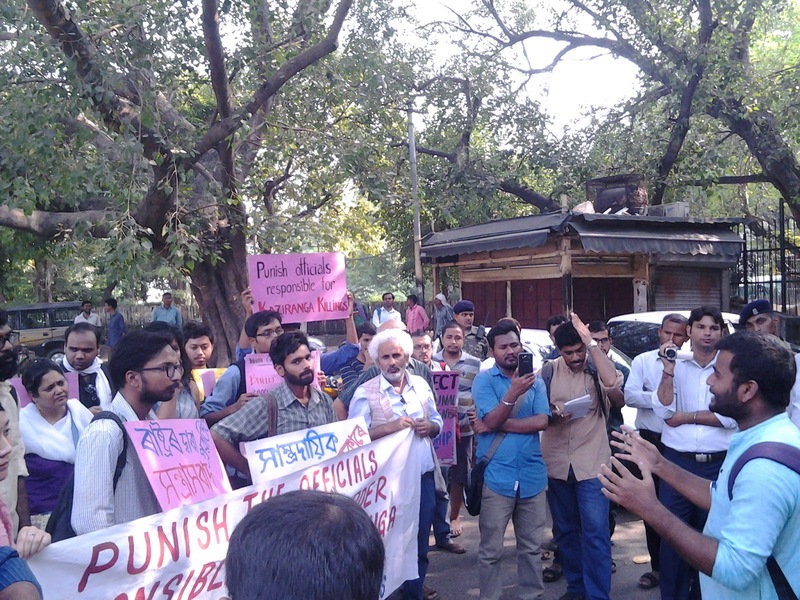 A protest was held outside of Assam Bhawan, Chanakyapuri, on Friday against the Police brutality during an eviction drive near the Kaziranga National Park which resulted in death of two villagers. 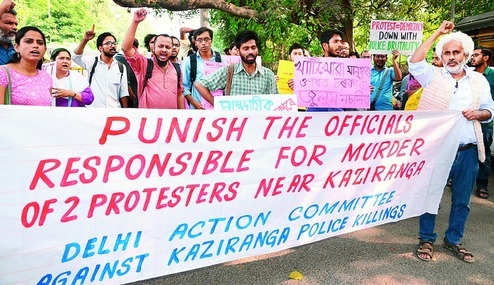 Despite prohibitory orders and heavy deployment of Delhi Police personnel and armed paramilitary forces at the venue, the 60 odd protesters under the banner of Delhi Action Committee (Against the Kaziranga Police Killings, Assam) continued to raise slogans against the dastardly killings by Assam Police. 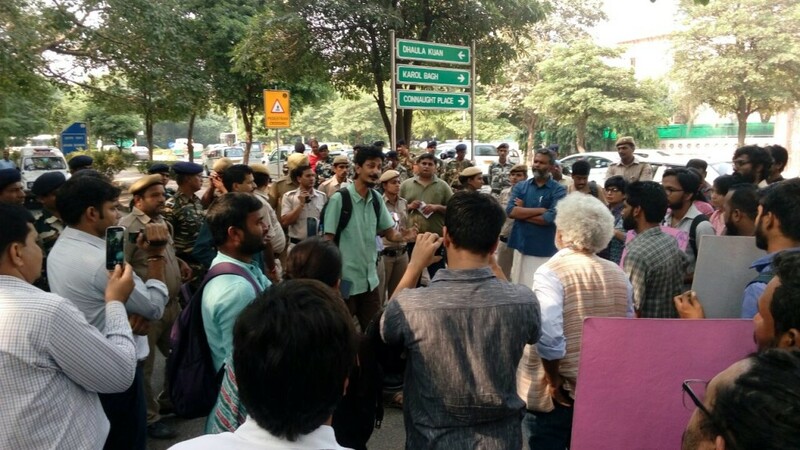 The protest was supported by left and left-leaning organizations like New Socialist Initiative (NSI), Campaign Against Fascist Attack on Universities (CAFAU), CPM affiliated All India Kishan Sabha, Krantikari Naujawan Sabha (KNS), Democratic Students' Union (DSU), National Alliance for People's Movement (NAPM) and Jhai Foundation (Assam) among others. 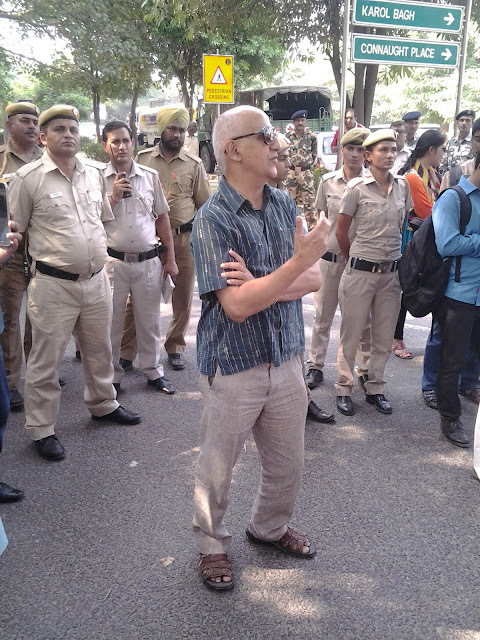 Bonojit Hussain of New Socialist Initiative and Delhi Action Committee, P Krishna Prasad of All India Kishan Sabha, prominent social activist Harsh Mander, Nayanjyoti of Krantikari Naujawan Sabha, Abdul Kalam Azad of Jhai Foundation and few others addressed the gathering. Later a 3 members delegation comprising of Bonojit Hussain, Biswajit Bora and Shalim M. Hussain submitted a memorandum to the Deputy Resident Commissioner of Assam government stationed at Assam Bhawan, New Delhi. Among many other demands, the memorandum submitted by Delhi Action Committee demanded that immediate compensation and rehabilitation be provided to all the evicted people of the villages; and an unconditional apology be rendered by the Chief Minister and the Home Minister of Assam to the people of these villagers and the country. The Delhi Action Committee delegation remind the Deputy Resident Commissioner that "after the BJP came to power in Assam in May 2016, the state government has unleashed a reign of terror to execute its fascistic agendas. Within 2 months into power, the government opened fire and killed a 25 year old man Mintu Deuri, during a protest organized in Raha against the transfer of the site for a proposed AIIMS in the state on 15th July 2016. Now on 19 September 2016, just 34 days after the Raha incident, the police has again opened fire and killed two people - Anjuma Khatun and Fakhruddin, at a demonstration at Banderdubi revenue village near the Kaziranga National Park. The protesters were demanding resettlement and adequate compensation against an eviction drive carried out by the mandate of the Gauhati High Court order dated 9 October 2015 which was supposed to happen two days later, i.e. on 21 September 2016 but had been pre-poned to avoid protests. The villagers, belonging mainly to the Muslim community of erstwhile East Bengal origin, have been residing in the village for more than half a century." The Committee delegation further brought to the notice of the Deputy Resident Commissioner that "out of the 198 displaced families from Banderdubi village, around 40 have moved in with their relatives and the rest have been compelled to seek shelter in Baghmari, a nearby village under the open skies. The Deputy Commissioner of Nagaon had not yet allowed any relief measures to reach them. And that, allegedly, the 7 Hindu families that lived in the village were informed before and were reportedly asked to move into safe places before the commencement of the forceful eviction drive, which highlights the communal agenda of the state administration. One of the most powerful ministers in the Assam government, Himanta Biswa Sarma, posted on his official Facebook page after the eviction drive that the new government would never compromise on "Jati, Mati, and Bheti" [Nationality, Land, and Home], a rhetoric of the homeland creating a paranoia against the Muslim inhabitants of erstwhile East Bengal origin, with which the BJP came to power. Thus in a true fascistic form, the repression has been accompanied with a parallel mobilisational drive, pitting one section of the society against another. Through electronic, print and social media, gross misinformation and falsehood has been consciously spread and we are told, this is a struggle to recover the Assamese nation from the outsiders – the Bangladeshis."